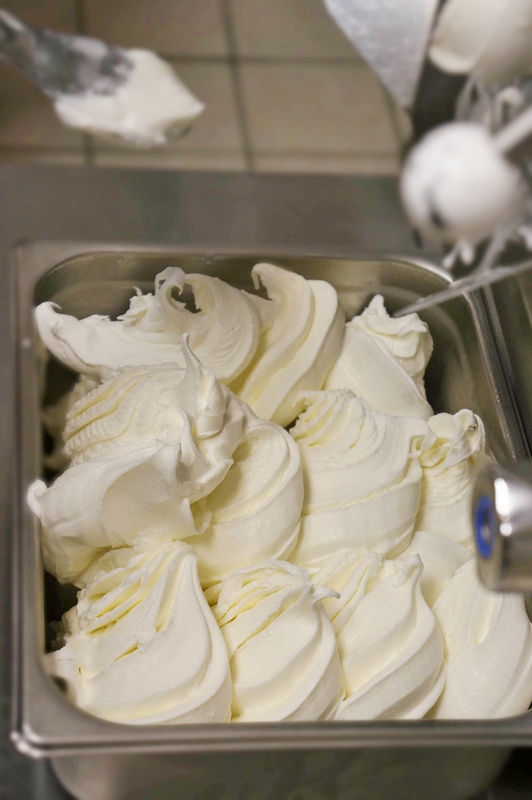 Making a gelato is complicated, yes, very complicated!! These small batch, artisanal desserts that originated in Italy have to be tough to make, right? That is what I thought until I took the gelato making class with a couple of friends at Mia Chef Gelateria yesterday. My friends and I had talked about doing a cooking class together and just around the Holidays, I saw a Living Social deal that offered the class at a discount. With one e-mail, I convinced them about the class (Inner voice to me: No, the gelato-making class pretty much did the work, all you did was type out the e-mail to your friends). Perfect way to begin the New Year, I thought – we will learn new skills, we will enjoy the output from the class, and it will be a fun thing to do. None of us discussed New Year resolutions and how this class would impact (or rather derail) those. 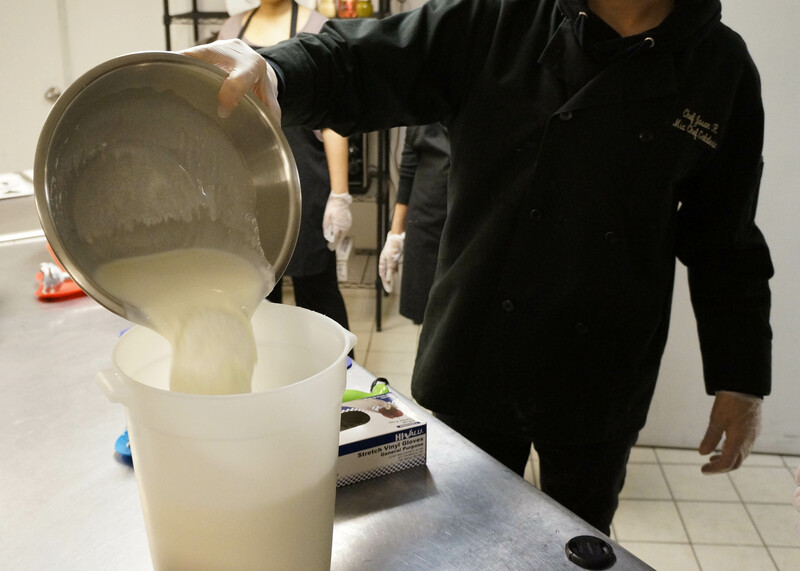 The class was held in Mia Academy – the culinary institute specializing in artisanal gelato. It’s in the basement of Mia Chef Gelateria. Mia Chef Gelateria is a gelateria in Murray Hill (see address at the bottom of this post). It has an entrance that is easy to miss. When you do find the entrance and enter the gelateria, you will soon realize that there are tables at the back to enjoy the gelatos. 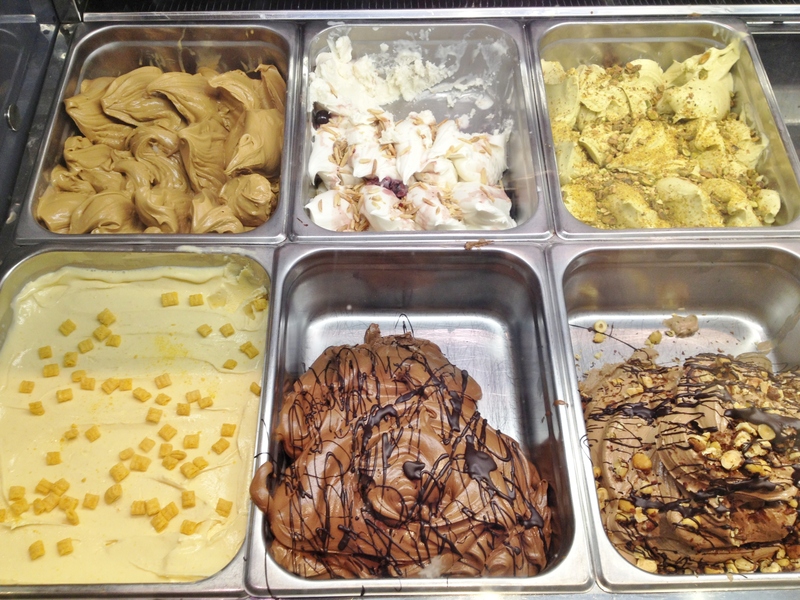 When we entered, we were given a taste of most of the gelatos on display. They were all delicious. Cap’n Crunch is apparently the most popular gelato. My favorite was …. the dark chocolate (no points for guessing that!). They also had two vegan flavors – Berry Mix and Dark Chocolate. The Berry Mix was made with soymilk, while the vegan chocolate gelato was made with chocolate almond milk. So, if you are allergic to soy or to almonds, you have a choice. The texture of the vegan gelatos (can I call these gelatos if they do not include milk and cream?) was sorbet-like rather than gelato-like, but tasted very fresh and natural too. Back to the gelato making class. The early morning snow that turned into hail late morning and the icy rain in the afternoon and evening made us feel like gelato making was the perfect thing to do that evening. No, I mean it. Apparently only women want to learn gelato making – all 9 of us were females. We had to work in pairs, but I worked by myself (a friend of mine could not make it). We made 4 flavors, cookies and cream, pumpkin spice, dutch chocolate, and virgin peppermint schnapps. Chef Jason began by explaining the differences between an ice cream and a gelato. In short, a gelato has lower fat, can be made without eggs, has less air, and more sugar (in most cases) relative to an ice-cream. For more details on differences between gelato and ice cream, see links at the bottom of this post. 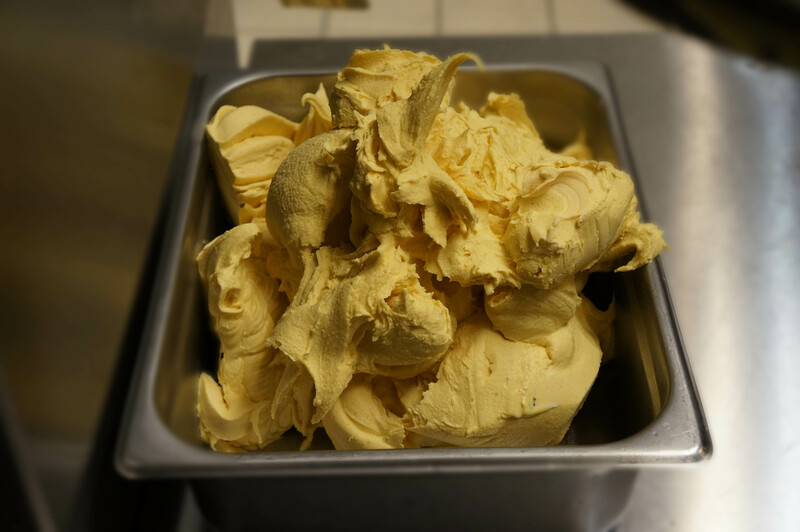 The main ingredients that make a gelato are: heavy cream, whole milk, sugar, skim milk powder, dextrose, natural stabilizers such as guar gum. All these ingredients make the base, while you add flavors such as chocolate, pumpkin, peppermint etc. You might be interested in knowing that a gelato can be just lacto-vegetarian or ovo-lacto-vegetarian, while an ice-cream is definitely ovo-lacto-vegetarian. All the flavors used in the class are neatly laid out on the table at the beginning of the class. For each of the flavors of gelato that we were making, Chef Jason gave us a printed sheet of the recipe to measure ingredients. We measured all ingredients on a scale and blended them together. 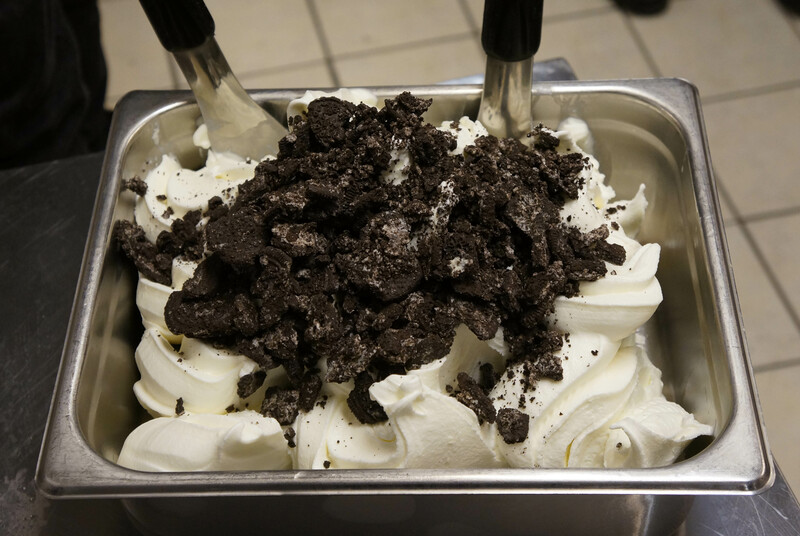 The gelato machine would make all our gelatos in one big batch. A gelato has to have the right combination of fat (cream) and sugar. Since all our material had to get into the same gelato making machine, we had to keep track of the amount of cream and the sugar we added. 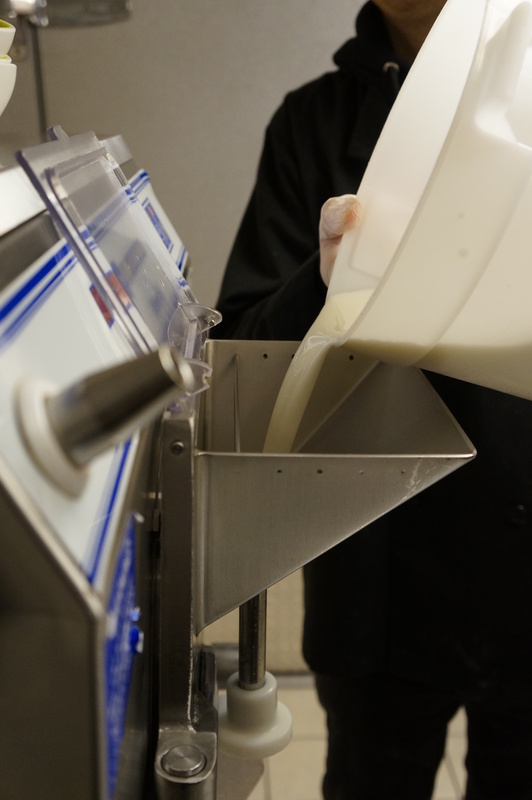 If one station went over on the cream, another station would reduce the cream they were adding, so the entire batch would turn out perfect. 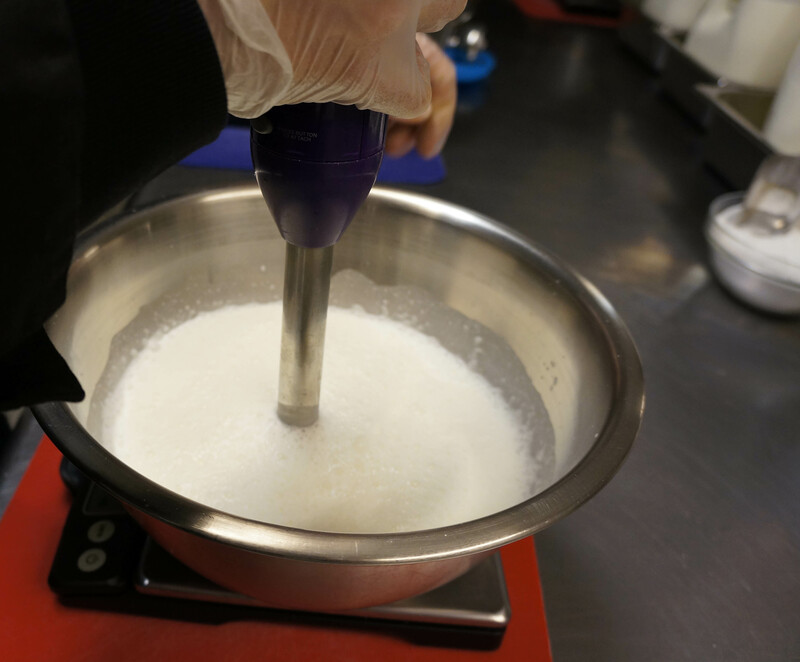 Here we are measuring the milk, cream, sugar, dextrose, skim milk powder, mia spice (the secret ingredient – no, the guar gum with some spices). I had the privilege of starting the machine for the very first flavor. 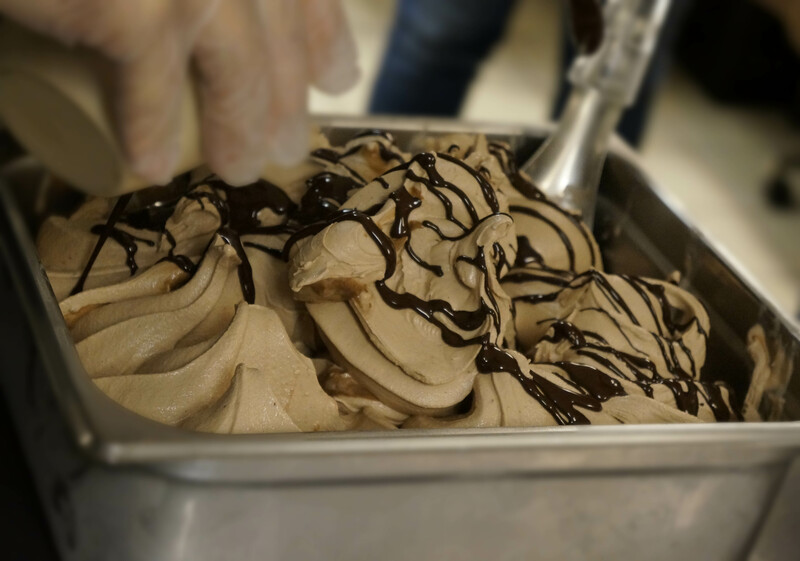 Measuring the ingredients was the toughest part of this gelato making class. Now you know how difficult gelato making is. No, seriously, it was NOT eating the gelato during the class that was the most challenging part of the class. Besides learning how to make the gelatos, and tasting them when we were done. 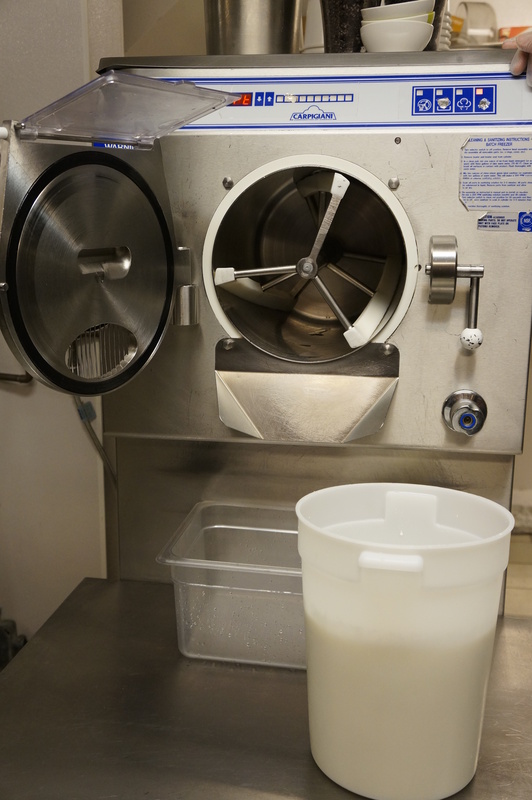 Chef Jason was patient in responding to our questions about using sugar substitutes instead of raw cane sugar, how the gelato making machine works / churns, etc. He gave us enough time to measure the ingredients, gave useful tips on using the immersion blender and avoid accidents (see this article in the NY Times – about the need to be extremely careful with an immersion blender), maintained a clean workspace (well, we spilled, he cleaned), packed up our pints with each gelato flavor, and kept the class moving on time. Mia Chef Gelateria also sells gelato making machines and ingredients to make your own gelatos at home. Take a look at some of these machines. The class wrapped up with a cup of hot chocolate made from their dark chocolate gelato. This was the only thing that fel short of my expectations. Yes, it was very thoughtful of them to offer it as we headed out in the icy rain, but it was extremely dilute and fogettable. There are many other places in NYC where you can get a cup of dark chocolate, so skip this one. How do you tell if the gelato is fresh? 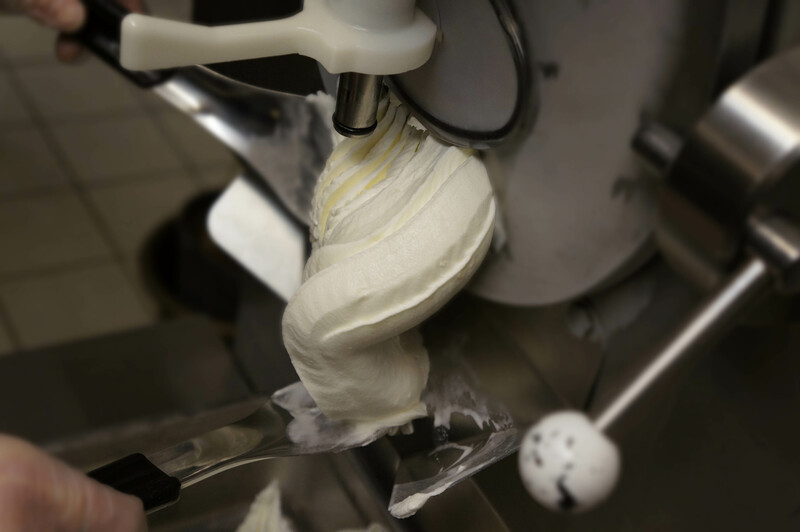 What are the differences between gelatos made in Northern Italy vs. Southern Italy? 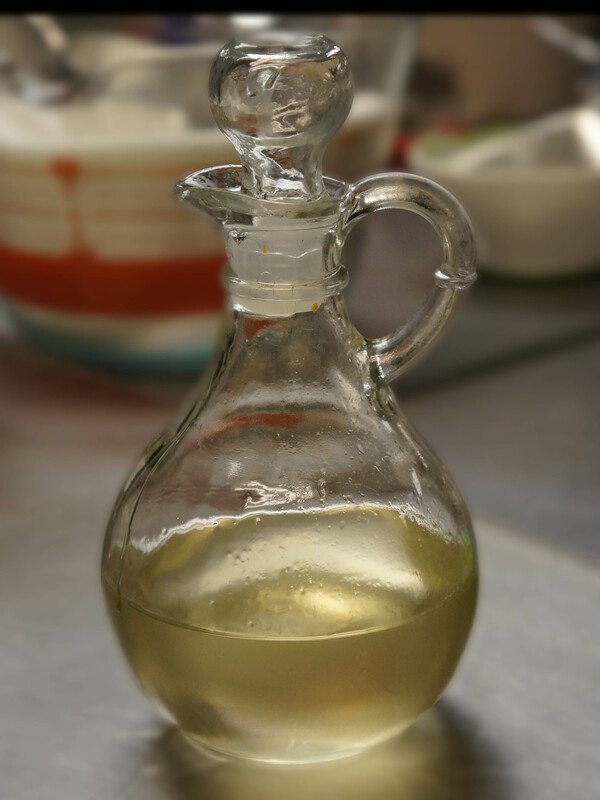 What test does a gelato connosieur or a food critic use to judge the quality of ingredients used in a gelateria? Why can you not make gelato with an ice cream machine? Why ice-cream parlors / gelaterias can be dangerous for those with food (especially nut and egg allergies)? 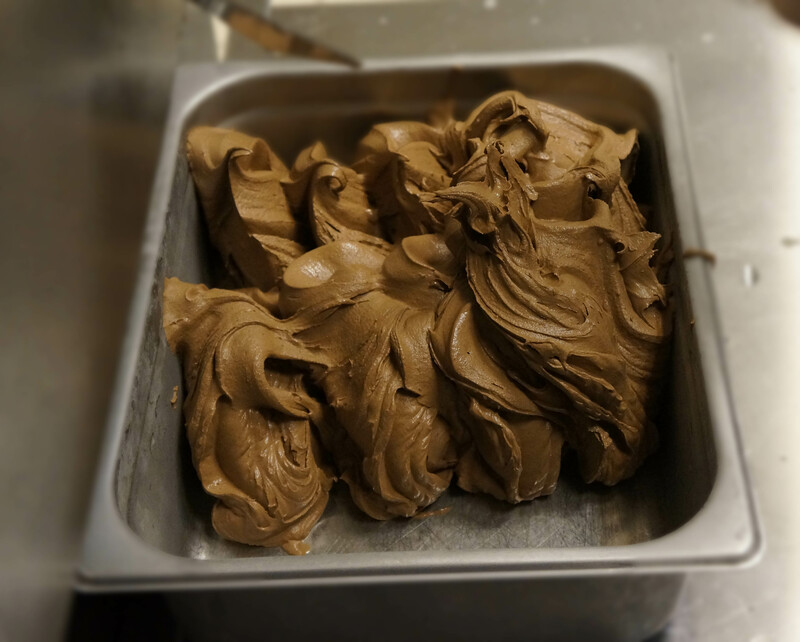 Take the gelato making class at Mia Chef Gelataria and you will get to know these interesting tips in addition to making and enjoying delicious all natural gelato. They have some other classes coming up as well – not all to do with gelato making. I’ll be sure to check them out and write about my experience in those as well. I am sure you want to know more about the differences between a gelato and an ice-cream? See this Chowhound board and this Serious Eats post. I left the class with pints of all natural, artisanal gelatos that need to be consumed within 7 days for peak flavor and texture – ideally to be enjoyed the same day. Nice predicament to be in, wouldn’t you agree? Meanwhile, I wonder – what are the differences between a gelato and a frozen yogurt? Yummy! My mouth waters just looking at the pics. Wish we could get to taste it! Forget the calories!